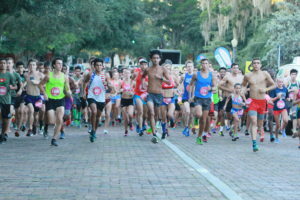 Runners, walkers and fitness enthusiasts of all ages will enjoy summertime fun in the Watermelon 5k, Tuesday, July 4 in Central Park in Downtown Winter Park. The 3.1-mile run/walk begins at 7:00 a.m. It’s an All-American-style celebration featuring a shady course, entertainment, ice-cold watermelon for all, free kids’ run, and the crowd favorite, the Watermelon Eating Contest judged by Florida’s Watermelon Queen. New for 2017, Florida Hospital serves up support for the run/walk as the title sponsor. “Florida Hospital is proud to partner with Track Shack on the Watermelon 5K in support of military veterans. Florida Hospital’s healthcare team includes large numbers of veterans in all areas of the organization, from doctors and nurses to chaplains to senior executives. The discipline, dedication and leadership shown by our veteran team members are invaluable in carrying out Florida Hospital’s mission,” said Sharon Line-Clary, the vice president of marketing for Florida Hospital. Discount entry fee to active and retired military personnel and their families. Invite a Veteran! Food Drive. Contribute non-perishable food items for distribution through the Orlando VA Medical Center’s VSO Food Pantry. Team Challenge. Runners and walkers form teams of any kind: corporate, running club, ROTC, church group, etc. All teams receive recognition and the largest team will have a $500 donation made on their behalf to a local 501© (3) organization that supports military service. Last year’s Team Challenge winner was Team Keep Judge Dan Traver. A $500 donation was made to ADL Service Dogs that trains animals to help veterans with PTSD. Proceeds benefit the Track Shack Youth Foundation, a 501 ©(3) organization whose purpose is to promote lifelong health and fitness emphasizing youth and running programs in our Central Florida community. Registration required. For more information or to register, run to TrackShack.com.